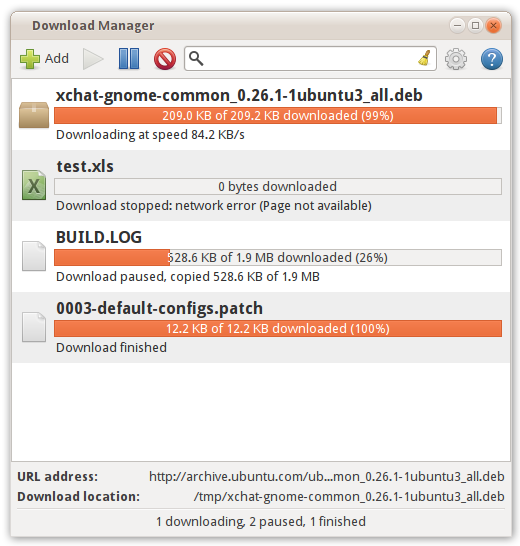 * A basic GNOME download manager, supporting all URL protocols known by GIO/GVFS. This includes, among others, HTTP, HTTPS, FTP and SMB. * Pausing, resuming, and restarting downloads upon application restart. * An application indicator, or a notification area icon for platforms without Ayatana libraries. * An instant search/filter box. * Ability to add downloads via the command line and D-Bus, for browser extension writers. * Notification bubbles upon starting and finishing downloads (can be disabled). could you mention whether this will work with flashgot or not? That will depend solely on the FlashGot developers. I’ll try contacting them. Update on my comment earlier: Steadyflow support will be in the next version of FlashGot.